As soon as I’d got back from my first bike ride with Dad, I wanted to know how I could go further afield. One day he came home from work with a map for me. This was an event in itself, because our family really didn’t ‘do’ presents. He casually dropped the Bartholomew’s map on the table, and I was so surprised that Mum had to prompt me to say thank you. The scale was half an inch to one mile (1:126720), relief was shown in shades of brown and green, and the coverage included much of Wharfedale and Nidderdale, which is the valley north of the Washburn. I’m not sure my conceptual abilities at the time were sufficiently developed for me to really benefit from the map, and it sat on the bookshelf for a while. Then its moment arrived. 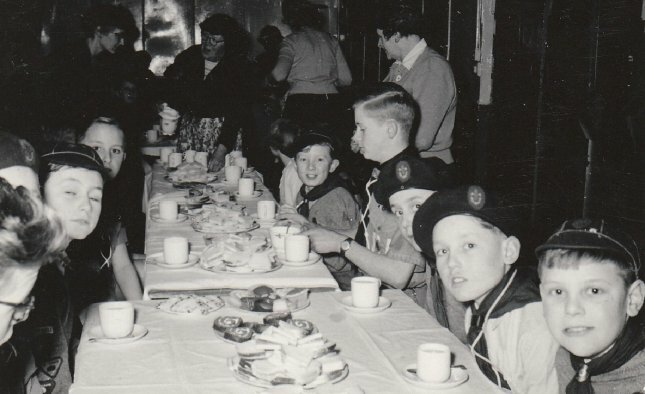 I was eleven years old, a new boy in the 2nd Otley Scouts. It was a time of change in the Troop: ‘Chiefie’ (Owen Holmes) was the aged figurehead; ’Shove’ (Norman Graville) was Skipper, but he was soon to stand down and be replaced by David Wardman, about six years older than me. 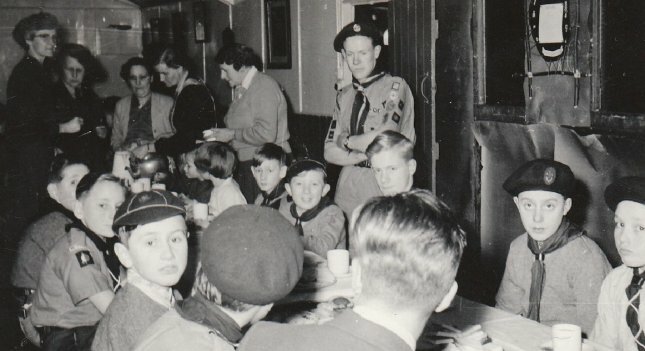 Scouts like Geoff Cook and Tony Loveridge, who were sixteen years old and towered above me, were on the point of leaving. 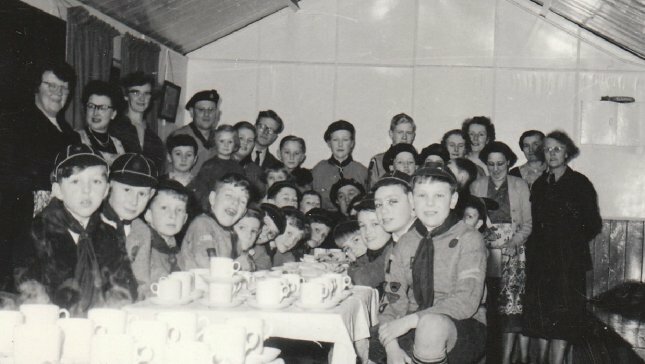 This left Derek ‘Cappo’ Capstick, aged fourteen, as leader of Stag Patrol, and he found himself in charge of a bunch of youngsters, all as green as grass. They included Tony ‘Guzzy’ Guzdek, Geoffrey Roe, Graham Mulley and me. My pals Robert Ledger and Michael Hardy joined Panther Patrol. We seemed to have been Scouts for no time at all when the District Commissioner announced a Saturday activity: a hike for Patrols to mark the opening of a new campsite at Curly Hill, near Ilkley. Cappo pleaded a weekend job that he really couldn’t default on, and the other Patrol Leader was also unavailable. For some reason, it fell to me to lead a small and unskilled bunch of eleven year olds. With relatively little planning or supervision, our group of six found itself walking towards Askwith. Each of us was contributing something to the venture: I brought my map, Robert packed the makings for a hot drink, Michael carried the sausages, and others came with a tin of beans, bread and cooking equipment. We found our way to the checkpoint at Scales House Farm on the edge of Askwith Moor, where we discovered we would be tested to see if we could identify our next objective. I was given its National Grid Reference, but unfortunately my map didn’t have national grid lines. We should have carried Ordnance Survey Sheet 96, Leeds and Bradford, at a scale of one inch to one mile (1:63360). I felt foolish. The organisers used their map to show me how to read a grid reference. They then gave me a test, which I passed. For our own safety, we were told to follow another group to the end of the hike, and eventually our straggling band circumnavigated the grounds of the isolation hospital at Middleton and reached the campsite. We warmed rather than cooked our sausages, burned the beans, and washed everything down with watery Oxo. How we got home the six miles from Ilkley eludes my memory. We had survived an unsatisfactory day, though it didn’t feel as if we’d had any fun. At home I reported ungraciously that the map wasn’t up to the job. That was true enough when hiking was the game, but it was brutal and ungrateful towards the considerate man who’d taken the trouble to buy it for me. I requested Sheet 96 for my birthday, and it proved to be one of the best presents ever. It revealed such potential. Every day after lunch I slid from my seat at the table into the old Windsor chair beside the kitchen fire and unfolded the map, losing myself in the symbols and names that defined mid-Wharfedale and Washburndale. My eyes absorbed the patterns of hill and valley, lane and footpath, and when my body had to return to school, it left my mind on the empty expanses of moor and the peaks around Bolton Abbey, planning and dreaming of hikes to come.